IP cameras are the last fashion. Every day that passes, there are more projects based on this solution, which has been considered as the latest technology in CCTV systems. The overwhelming majority of articles published about P systems emphasize its benefits and advantages over analog systems. It is true that IP technology has its benefits, but it is also essential to know its limitations. IP cameras are not the latest technology in CCTV systems. Actually they were launched in 1996, just after the first DVR video capture card. My first test with video capture cards occurred at the end of 1997 and about 6 months later, I've had my first contact with an IP camera, a Philips NetCam-4. IP cameras are designed for certain situations where it would be impractical to install a DVR or the great distance between installed cameras would exceeded maximum length allowed for the cabling. This situation occurs when monitoring roads, streets, ports, etc., where there is no suitable place to install a DVR and cameras can be miles apart. To meet this need, it was used a circuit of one DVR channel, which was installed inside the housing of an analog camera, thus resulting in an IP camera. Therefore, there is no technological difference between an IP camera and a DVR. Incidentally, DVRs also act as video servers, allowing images from multiple cameras to be viewed remotely via an IP network, with the advantage of locally recording the images of these cameras. CCTV means Closed Circuit TeleVision, where camera video output is connected directly to the DVR / monitor via physical cabling. This configuration ensures that images of connected cameras will be sent continuously to their destination, 24 hours a day, the minimum required for surveillance systems. In the analog camera diagram, dotted area is a CCTV system, that is a closed circuit, ensuring that images will arrive and be recorded at the destination. In an IP camera diagram, images are only viewed and recorded after and only if they pass through the network. For this reason, IP systems cannot be called CCTV as they are open circuits, since they depend on other variables. While the image of a camera directly connected to a stand alone DVR is displayed in real time at 30 frames per second and without any delay, the image of an IP camera is digitized, assembled into packets, transmitted over the network and received by the NVR to then be displayed. See more details of this process in Video Signal Transmission. By the above diagrams it is also quite clear that the cost of an IP camera is greater than the cost of an analog camera, since there is there is practically a DVR inside each IP camera. Due to this, IP cameras cost about twice as an analog camera with the same characteristics. Not to mention that image packs still have to go through extremely expensive edge and core switches before they reach NVRs where images will be recorded. That is, besides IP camera being more expensive, existing cable between camera and its destination is also much more expensive and complex than in an analog system. Going through so many processes, the image of an IP camera will not make it to the monitor with the same frame rate and no delay as an analog solution, which makes the latter unbeatable for situations where there are operators monitoring live cameras. The higher cost, the need for greater bandwidth, greater processing capacity, low performance and lower system reliability show that IP cameras are not reliable for serious applications (surveillance systems) and so were initially relegated to monitoring functions (streets, etc. ), where a temporary loss of the images is not as critical. About 20 years ago, CCTV systems weren't for anybody: Only large customers could afford it, ordering systems to large integrators, who installed big brands equipments. At that time, only two American manufacturers offered speed domes. For fixed cameras, the only option was the professional box type, with lens apart. In a second phase, first micro cameras manufactured by small Asian companies started to appear in the market. They were much more affordable but of very low quality, which didn't bother major manufacturers at all . However, over time, these small manufacturers learned to make quality cameras - including speed domes - good enough to compete in performance with the big brands. As its price was much lower, they began to dominate the market, including large customers. To avoid losing market, major manufacturers have called for an ancient and forgotten technology: IP cameras, a segment these small manufacturers still didn't dominate. But how to convince the market to pay more for a technology with a worse performance and lower reliability than analog CCTV? Using the strength of their brands, major manufacturers began to convince the market about the "superiority" of IP cameras, with a massive marketing campaign saying that IP cameras were the latest technology, that analog cameras were outdated, that IP is the future, etc. And this brainwashing worked; conveyed ideas were readily accepted by large customers, who were more concerned with the status of the brand they were acquiring; by ill-informed consultants and installers aimed at a higher profit in the project, since final cost would grew. A lot. I witnessed many atrocities committed in this process. The worst I ever seen was with two of the largest hospitals in Sao Paulo - Brazil, whom had installed over 1000 IP cameras, all at D1 resolution! What didn't make any sense, since cameras were all installed in corridors or rooms near each other. A DVR on each floor, concentrating cameras from that floor, would be much more efficient and much cheaper. Then all DVRs would be connected to the network, with images being watched in a VMS software. For the customer, this would be transparent because when watching the images on a remote software, he couldn't identify if installed cameras were IP or not. At that time, I did a simulation of the cost for one of these works and what it would cost if it were made ​​with analog cameras and I found that it had cost 20 times more!! When sensors manufacturers managed to break through the barrier of low-resolution analog systems, creating megapixel image sensors, IP solution was the only way to transmit images with higher resolutions than VGA (640x480) or D1 (720x480), which was the limit for analog video (CVBS). It was the evolution of SD (Standard Definition) to HD (High Definition). Now IP solution begin to show some advantage over analog solution; be able to enjoy images with better definition just makes up all the disadvantages described above. And that made ​​the "IP indoctrination" even more strong. In an analog CCTV system, compatibility is total: Any camera, from any manufacturer, works with any DVR. For IP systems, there hadn't been a initial standardization; each manufacturer developed its own image compression system and network packet assembly method, causing cameras of a particular brand only worked with a NVR or remote software of same brand. Trying to standardize IP cameras, forums such as ONVIF (Open Network Video Interface Forum), PSIA (Physical Security Interoperability Forum) and, more recently, the ONF (Open Networking Foundation) were created. ONVIF standardization has become the most popular, making everyone to ask before purchasing an IP camera if it was ONVIF compatible. And the vast majority of manufacturers began to offer ONVIF compatible cameras. It seemed that problem was solved: Now you can buy any IP camera and connect it in any NVR or VMS software that it will work perfectly, right? But it is not so. Being ONVIF compatible means that only a few features of a camera from a particular brand will be available if the NVR or remote software are from another brand. In an analog CCTV system, image is sent through a physical cable to the DVR and displayed with same resolution and frame rate (30 fps) that came out of the camera. Without any delay. And, depending on customer needs, these images can also be recorded at the same settings above. - Or to view images in real time, but with a lower resolution. To save bandwidth, cameras send images only when they detect movement. That may be acceptable for monitoring situations, but companies where there are operators looking at images 24 hours a day, would accept this condition? System always showing last image sent when it was detected last movement, which will be updated only when there is a new movement detected? This one is very creative; costumer defines regions of interest, where images will be sent in higher resolution; the rest of the image will be sent at a very low resolution, pixelated . A variation of the same feature is the application for facial recognition; people's faces are shown in greater resolution while the rest of the image will be sent at a very low resolution. It should be the same question already posed earlier: Companies where there are operators looking at images 24 hours a day, would accept these conditions? System always showing (and recording) part of the image in low resolution? I already said that IP systems are not reliable for applications in video surveillance because, for not being closed circuits, there is no guarantee that images sent by cameras will arrive at destination to be recorded and / or displayed. Aware of this failure, manufacturers invented the edge recording, which is nothing more than a memory card inserted in the camera, with the function of recording images locally, if network falls and until it is restored again. But at least one manufacturer did it right: He installed a USB port on his IP camera, where you can connect an external hard drive with some terabytes of capacity, which will record all images all the time, without any delay and no resolution nor quality restrictions, not even needing to have a remote NVR in the system. Camera will send just one video streaming to a remote monitoring software. As I already had explained in detail in Video Signal Transmission, network packets assembly and disassembly process generates a delay in receiving images at the target, i. e., recording and viewing does not happen in real time. Delay can vary from less than one second to several seconds depending on how much had been invested in network infrastructure. For fixed IP cameras, this limitation may even be acceptable, but not for mobile PTZ type cameras. When an operator moves the keyboard controller's joystick, a control signal is almost immediately sent to PTZ camera, which will also move as soon as it receives the command. However, as the image has to go through the process already described above, image will reach the DVR with some delay, causing camera movement being displayed with delay and at a rate lower than 30 frames per second, making it quite annoying - if not almost impossible - tracking someone with an IP PTZ camera. Recording presets for most viewed points avoids operator to keep trying to find each point every time he needs. Performing guard tour with recorded presets. This is another feature that had been created more than ten years ago and was rescued to help a PTZ IP camera to automatically tracking someone, since doing it manually is almost impossible. It's very easy to adjust lens focus with precision in an analog camera: You simply move the focus ring to instantly see the result in a monitor connected to camera's composite video output. For IP cameras, as image takes some time to catch up on the screen due to the latency, it's very difficult to adjust lens focus. To address this, some cameras have an auto-focus feature, which increases its price. The support gave by CCTV systems integrators was one of the factors that contributed mostly for the success of IP cameras. But they never knew the evil that this would cause to them. A computers network connected to a central server and to the internet is an essential item for every company to operate. To install this network, it is usually hired an IT infrastructure company. Having a CCTV system is also essential, with cameras installed in vital points, protecting its assets. To perform this service, It was usually called a CCTV installation company. I said "was" because this used to happen until IP cameras being popularized; now IT infrastructure companies are being asked by their customers to also install IP cameras. After all, aren't they already there, installing UTP cabling? Besides that, when it comes to network dimensioning, bandwidth calculation, selecting appropriate switches, etc., they are more skilled in the art than CCTV systems integrators. The fact is that, embracing IP cameras, integrators ended up bringing IT infrastructure companies to its already very disputted market. But I don't think IT companies are wrong in taking over this service. After all, they hadn't fight for it; it was given hand kissed by CCTV integrators. 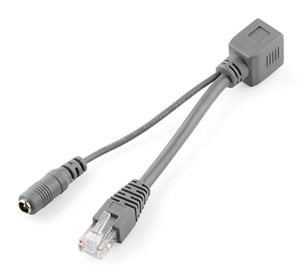 PoE (Power over Ethernet) was invented for laypeople could install small devices on the network such as routers, switches, Wi-Fi repeaters, etc. without the need of having an AC outlet near. It did not take too long for IP camera manufacturers to incorporate power PoE in their cameras. And that was another technology that CCTV systems integrators embraced, now shooting at their both feet, because if IT infrastructure companies still saw some difficulty in installing IP cameras due to the need of external power to operate, now this difficulty has ceased to exist. And this wasn't necessary; any installer that worth its salt knows how to use Ohm's Law to calculate the most appropriate wire gauge needed to power each camera. Now not only IT infrastructure companies know how to install IP CCTV systems, also lay people are able to do it alone; just check how many do-it-yourself IP cameras and NVR systems are being offered in home centers. PoE power consists basically in sending 48 Volts DC through not used pairs of network cables, so you can feed devices connected to the network without the need for external power. In the case of IP cameras, which are normally fed with 12 Volts DC, a power supply is installed inside the camera to convert the 48 VDC to 12 VDC. This 36 Volts reduction dissipates heat, which will overheat the camera, making it work outside its ideal conditions. Although manufacturers specify that a camera can operate in temperatures, for example, between 0 and 50° C, its characteristics are measured at room temperature, between 22 and 25° C. This means if a camera is operating overheated, its performance is impaired and may even shorten its life. Once I was testing an IP PoE micro dome from a manufacturer who claimed it was "small enough to fit in the palm of your hand." Yes, it was very small, but despite of that I couldn't put it in the palm of my hand, so hot it was! Therefore, when choosing PoE cameras, I recommend leaving them fully operating (sending images, IR on, etc.) for at least 15 minutes to see if it gets very hot. Anyway, the most recommended is to not use the internal PoE camera feature; an external PoE splitter is a more efficient solution, since it will prevent the camera to overheat, without having to spend more money on a PoE camera. In 2010, the HDcctv Alliance released the standard HDcctv 1.0, allowing sending Full HD video signals over coaxial cable. HD-SDI was the first technology to use this standard. HD-SDI cameras has a price equivalent to IP cameras, the maximum distance is around 100 m and they can transmit images in Full-HD resolution. But lacked an aggressive marketing campaign for the HD- SDI technology took off. However, in 2014, it was launched the HDcctv 2.0 standard, with cameras at a most attractive prices and allowing for greater distances over coaxial cables and even over UTP cables. HDcctv 2.0 was readily adopted by Asian manufacturers, which launched HD-CVI, HD-TVI and AHD technologies, among others. Nowadays, HDcctv already has a share of 10% of CCTV market and the trend is to grow, advancing in both analog and IP markets. The forecast for 2018 is that HDcctv will have 45% of the market; SD resolution, 40% and IP, just 15%. For a system to be called Full HD — the current digital TV standard — it needs to work with images at a resolution of 1920x1080 pixels and at a 30 fps frame rate, end to end, that is, images displayed on the monitor must also have that resolution and same frame rate. An IP camera can be Full HD too; it can easily deliver images at 30 fps with resolutions even greater than 1920x1080 pixels (see article 29 Megapixel IP Camera). However, for an IP system to be a Full HD system is a bit more complicated. Hardly an IP system will be able to display Full HD images from multiple cameras. It would be needed a lot of investment in switches and processing power (servers ) to get close. Thus, for resolutions up to 2 megapixels, it's quite clear that it isn't worth investing on IP cameras. The Full HD over coax solution is the best choice in terms of performance, reliability, simplicity and price. - Cameras connected via radio. However, if you have more than one camera concentrated in the same place, it's worth installing a four channels DVR connected to the radio. By now you may be thinking: - Wow! This guy hates IP cameras! No, that's not true, I'm all for IP systems, I just don't think a solution needs to be IP end-to-end. I am against this market trend that IP cameras are suitable for any situation. So I tried to show in this article that IP cameras are just another option to consider. Each case must be analyzed rationally, with great technical background, always looking for the best cost / benefit solution for the customer, not worrying about trends. I do not believe in a single solution that would attend all situations. In the second part of this article, learn how to design IP systems in an efficient and smart way. Like this article? Live a comment!